For starters, I couldn't find a convenient data source for the election results. All of the ones I could find were either for a single state, or they had some sort of GUI interface to view the data ... but no text csv files or spreadsheets to download, or even a simple HTML table. So I did a lot of copy-n-pasting and built my own spreadsheet, and then used Proc Import to import it into SAS. Once the data was in SAS format, I wanted to plot it on a map. But I couldn't use just any map (such as the US county map), because this data was by congressional districts. The borders of these congressional districts get re-drawn every 10 years when we have a census, and sometimes more often than that. After a bit of searching, I found that I could download a shapefile of the polygons from the data.gov website. 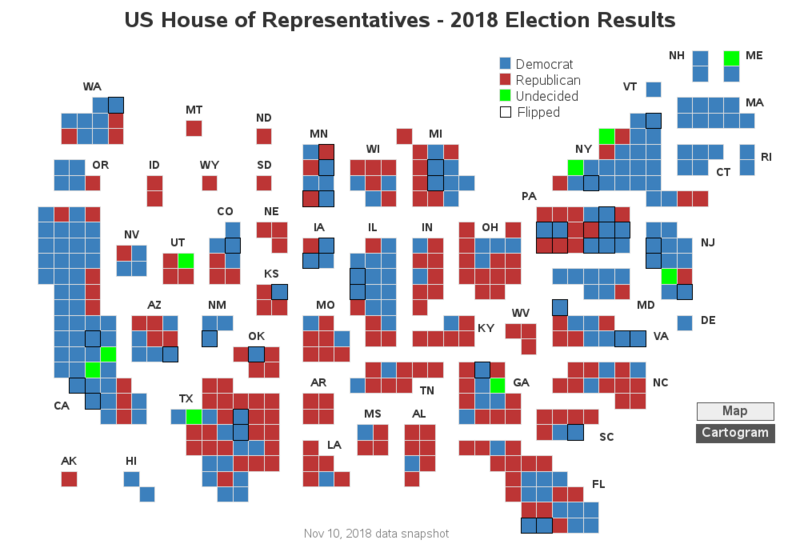 The most recent map I could find was the 115th congressional districts, so I downloaded that shapefile, and imported into SAS with Proc MapImport. 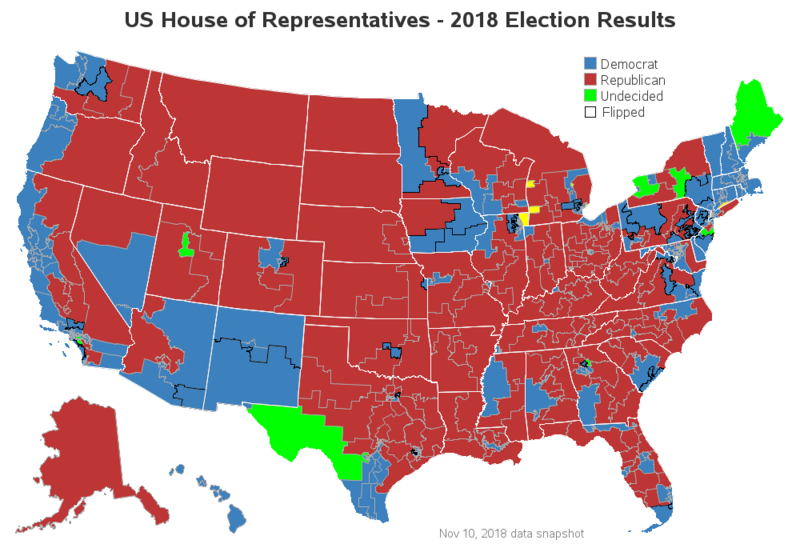 By design, each of the congressional districts has approximately the same number of people, and therefore the districts including large cities where people are densely packed are geographically very small ... which makes them difficult to see in a traditional map like the one above. As you probably notice, the areas in the map are not recognizable (in shape or position), and it's difficult to compare the areas since they have varying shapes. This type of cartogram is what I consider a 'bad map' - I see no redeeming qualities in this type of cartogram whatsoever. Thankfully, funky cartogram maps have fallen out of favor, and you don't see many people publishing maps like the one above anymore. 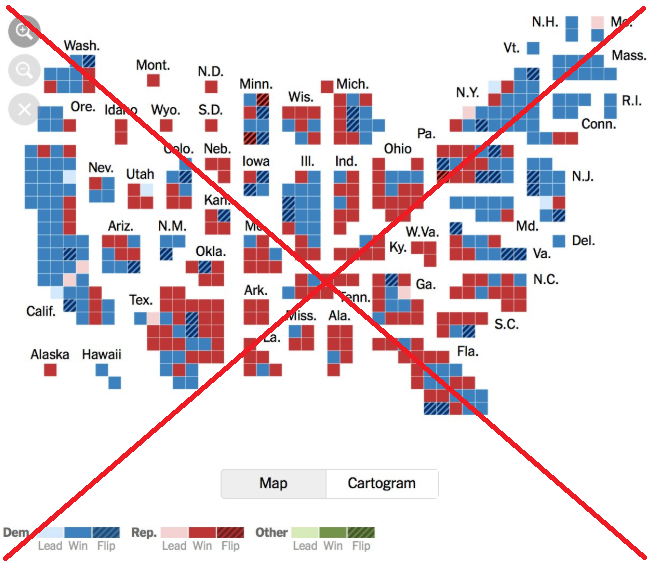 They did a decent job of arranging the squares such that the states are in somewhat recognizable shapes, and somewhat correct relative positions (the labels help, of course!) I also liked that they had a button to switch between the cartogram and the regular map (of course, this feature doesn't work in the screen-capture on Twitter). But I thought the map had too many colors/patterns - there were 9 colors/patterns identified in the legend, and that was just too many for my brain to keep track of. Therefore I set out to create my own new/improved version of the cartogram. In my version, I decided to use just 3 colors - Democrat, Republican, and Undecided. And I simply draw a black border around the districts that flipped (changed party). I also shortened down the labels to the standard 2-character state abbreviations, and added a title and footnote. Note that I annotated some buttons at the bottom/right to toggle between the traditional map and the cartogram. I think it's great to see the data plotted both ways, to get a better understanding! Click the images above to see the full-size interactive maps, with HTML mouse-over text, and the buttons to toggle between the versions. Are you saying "Wow! - I didn't know SAS could do that!"? If you're curious about the details, here's a link to my SAS code. I’ve been wanting this map! Thank you! Is there a link I can click on that shows an updated version of this map as the remaining elections are resolved? This is the best representation I've ever seen of congressional district voting results nationwide. What happened to Michigan in the traditional map? That's how they made the shapefile for the districts (ie, they included the water). It's similar (but not as noticeable) for the North Carolina coast. That's awesome! I always say when the regular map is used that dirt dont vote! The open rural areas need to be accounted for people not vast areas of dirt and rock. Wondering if you are a related Allison. This seems like the sort of thing my relatives would love. 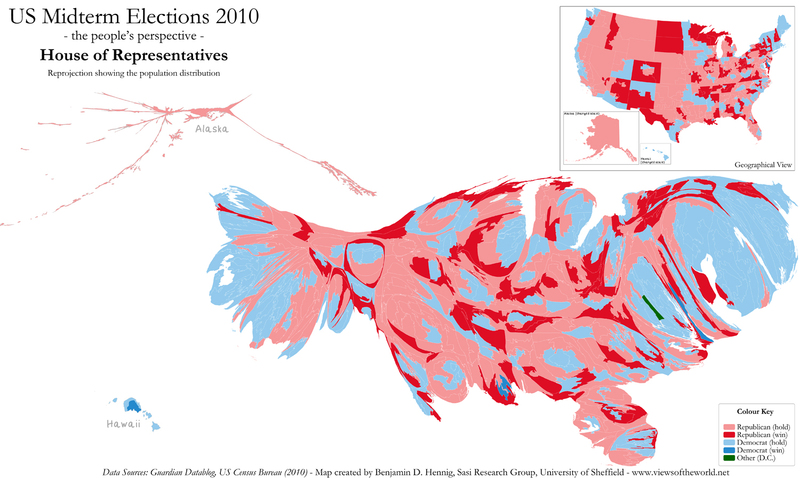 I think you have Utah labeled as Nevada in the cartogram. There are 2 "NV". I like this cartogram better than the 'tiled' style I saw in the Economist a few weeks ago. "Exploding" the country helps put the states in better relative positions. Nice work! Good catch - thanks! I've fixed it now! Great way to present the data so the geographic size of a district becomes a non-factor in the display.